N4109C – 7727 was first registered ZU-AGC and flown for a couple of years in South-Africa. In August 1994 she was airfreighted to Belgium and registered N4109C. 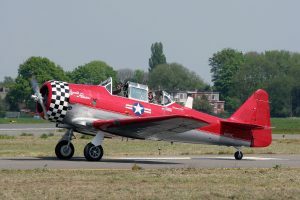 In the early years she wore a red colorscheme and had the name ‘Seaview Princess’. She was operated by the Stampe Museum in Deurne/Antwerp in Belgium. 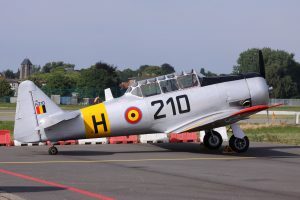 In 2011 she was repainted in Belgian Air Force as ‘H-210’, the colors of the aircraft of Lt.Baudouin de Changy, which he was flying when shot down on July 17th, 1960 during a mission over the Congo (Congo-Kinshasa). In an attempt to destroy a machine-gun position he was hit and had to make an emergency landing, which he survived. While trying to climb out of the cockpit he was murdered by the rebels and his body was thrown in the river…. Taken on Strength/Charge with the South African Air Force with s/n 7727. To unknown owner with c/r ZU-AGC. To Seaview Princess Inc, Whippany, NJ with c/r N4109C. Certificate of airworthiness for N4109C (T-6G, S-A-078) issued. 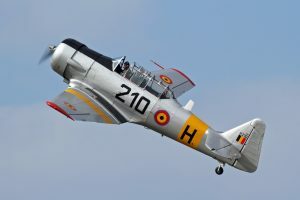 Based at Stampe and Vertongen Museum, Deurne Airport, Antwerpen (Antwerp), Vlaams Gewest.